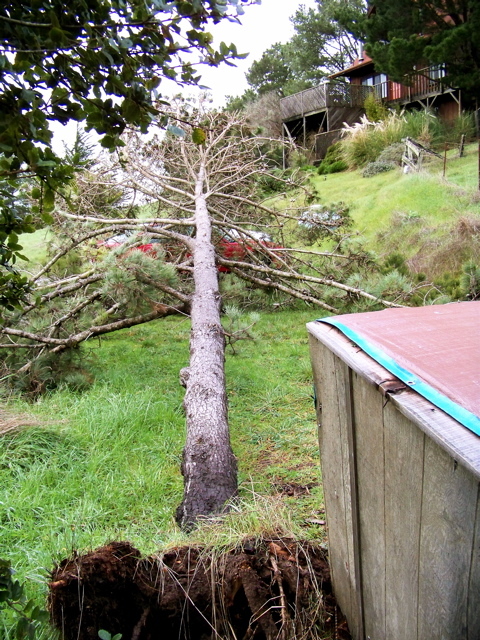 The start of an expected two weeks of storms is wreaking a bit of havoc in West Marin. In Point Reyes Station, a total of 6.76 inches fell Sunday through Wednesday. On Tuesday and Wednesday, Highway 1 experienced light-to-moderate flooding (above) in several spots just south of town. 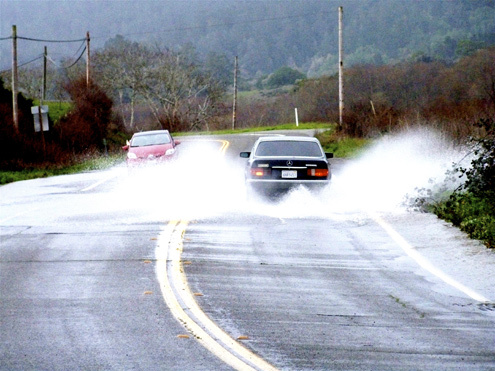 Flooding was worse on numerous other sections of roadway in East and West Marin. On Wednesday, Tomasini Creek flooded Mesa Road just north of the erstwhile Red Barn in Point Reyes Station. Walker Creek flooded Highway 1 south of Tomales. The highway was also flooded near Point Reyes Vineyards north of Point Reyes Station. That left residents of Marshall, who were caught between two flooded sections of Highway 1, unable to drive very far north or south for a day. Out of fear that school buses could be blocked by flooding, Shoreline School District on Tuesday canceled classes at Tomales High but — oddly— not at nearby Tomales Elementary. On Wednesday, Shoreline canceled classes at all its schools except Tomales High. Bolinas-Stinson School District also canceled classes on Wednesday. Around 7 a.m. Tuesday, a tree fell across Lucas Valley Road in Nicasio, blocking both lanes and bringing down powerlines. Countywide, the storm blacked out more than 1,000 homes and businesses during the day. More blackouts occurred Wednesday, and 500 homes and businesses were still without power at the end of the day. Early Monday morning, a mudslide in the Sausalito area blocked two lanes of the Highway 101 freeway for a couple of hours. On Tuesday morning, another slide briefly closed one lane of Highway 1 south of Stinson Beach. 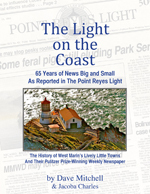 The National Weather Service had predicted today would be the height of the storm, and at day’s end, Weather Underground reported that more than 3 inches of rain had fallen in Point Reyes Station. The Independent Journal meanwhile reported that part of Nicasio had received 3 inches of ice and hail. Atop coastal peaks, gusts reached 70 mph. On the Beaufort Scale, that’s just 3 mph short of hurricane force. A near miss: Around 2 p.m. today I drove downtown to pick up my mail, and when I returned to my cabin half an hour later, I found a 35-foot-high pine had fallen where I park my car. No doubt high winds and saturated soil were to blame. From the looks of things, my car wouldn’t have been totally crushed by the falling tree, but it would have been damaged. For once I was glad I wasn’t there when the news happened. Wow Dave, somebody was watching out for you, as you could have been in the car. I am so thankful you weren’t and you are ok — except, you have a tree in your driveway. Yes, this has been a lot of rain. Thank you for ALL this info. on Marin County. You are the greatest. Love ya, Linda, and Terry too. Sparsely Sage and Timely is powered by	WordPress 4.9.10 and delivered to you in 0.353 seconds using 54 queries.